Look Good…Feel Better is a charity set up to provide free support and workshops for female cancer patients who want to look and feel more like their ‘normal’ selves during a difficult period of their lives. Workshops are hosted by volunteer beauty consultants and women leave the two hour sessions smiling, uplifted, with new skills and a fresh feeling of confdence. 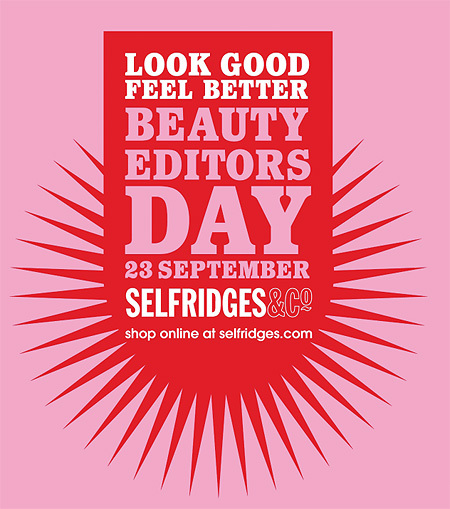 Over the last 4 years, Selfridges has partnered with Beauty Editors and Brands to hold a special event in aid of this wonderful charity and this year promises to be the best yet! Over 20 prestigious beauty brands with over 20 top Beauty Editors from leading titles including Vogue, Cosmopolitan, Hello and Marie Claire, will be offering one-to-one advice and the best beauty hints and tips. This year the event will take place on the 23rd September at Selfridges Beauty Hall, Oxford Street, London from 11am – 5pm. Not only will there be information on beauty advice, top tips, secrets and trends but also fantastic mini make-overs and a complimentary gift bag, generously donated by participating companies.